I’ve put together some light “scoring” rules for He Sees You When You’re Sleeping for people who might play once a year and want to compare against previous year’s results, or if run in a convention-style setting. I’ve never really done scoring rules before so please bear in mind these are super amateur and also if you have suggestions for additions / modifications to these please feel free to toss them in the comments below. Be warned if you are a player in this adventure, the following is definitely full of spoilers. Enjoy! If the party rescued Brigitte and/or Karl, award them 2 points per child. If the Daughters of the Dark Winter are stopped from completing their ritual, award them 5 points. If the party arrived early and stopped the Daughters of the Dark winter from even beginning their ritual, award them 3 points. 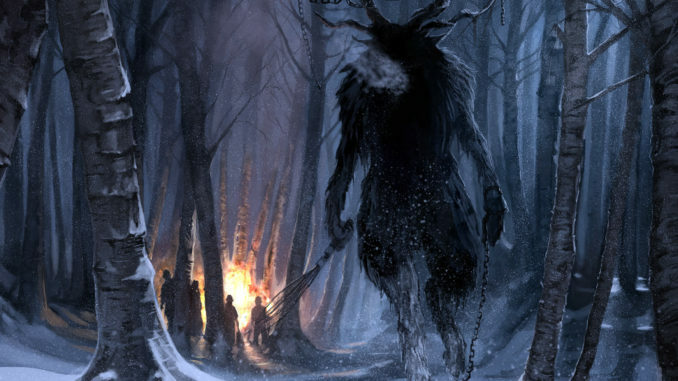 If Krampus is defeated, award 5 points. For each child still alive after the final encounter with Krampus, award 1 point. For each that died, reduce the point total by 2.